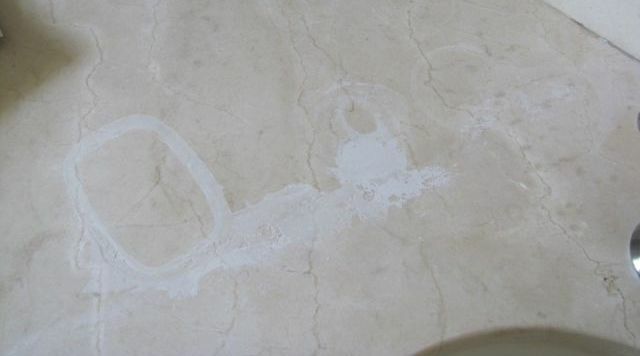 It is important to first identify whether your marble is stained or etched. First, let’s compare staining vs. etching. Quite simply, if the affected area is darker than the natural stone’s colour, you have a stain. Alternatively, if the affected area is lighter than the natural stone’s colour, you have an etch. Notice the large blot in the middle of the counter-top below. You can see the marks are lighter than the stone surface. Okay, so now we can identify etches and stains, but what causes them? The most important thing to keep in mind about your natural stone is that it is absorbent. Like a sponge, your stone is porous – meaning that liquid spills can seep into the stone and cause these discolourations. Marble staining occurs when a liquid is absorbed into the stone and is trapped beneath the surface. It is essential you ensure your surfaces are always properly sealed! Stone etching is mostly caused by, but not limited to, acidic liquids. The acidic liquids corrode the stone surface, eating away at the finish, resulting in the etched look. It only takes mere seconds after spilling for these deficiencies appear! Common household liquids that can be responsible for your discolourations include bleach, citrus, citrus-based products, alcohol and alcohol-based products, sodas, ink, rust, urine, coffee, cooking oils, and hand lotions… to name a few. Many make the mistake of using improper cleaning products for their stone floors or countertops. Always be attentive about the make-up of the product, as many can lead to damaging the stone, sealer, and even making the affected areas worse. We highly recommend the R311 Spray or MC24 as daily cleaners, which can be found below. Stains – (Poultice) The concept of poultice is to absorb the stain from the natural stone. Our wet poultice can be purchased from the online store. To use the poultice, simply: clean the surface of the affected area, apply a thick amount of poultice with a putty knife, cover up with plastic and tape down all edges, let it sit for 24 hours, lift one large corner of the plastic, let the poultice dry for another 24 hours, remove poultice and clean surface. Learn more about stain removal HERE. Etches – (Marble Refinishing Kit) The Marble Clinic has put together an all-in-one Marble Refinishing Kit. This kit contains all the items necessary to properly and safely remove etches. Learn more about the Marble Refinishing Kit on THIS PAGE. Please help. I sanded and polished my black marble hearth to remove etching and now there is a huge milky area with tiny bright white dots all over it. It would likely be the polish you used, it’s hard to say without actually seeing it. An option we would suggest would be to try our refinishing kit, it is quite useful especially for small areas. Don’t hesitate to contact us if you have any further questions or concerns. The Marble Clinic specializes in the protection, restoration, repair, and maintenance of all natural stone. Natural Stone for Air Quality! Canada's leader in natural stone protection, restoration, repair and maintenace. We'll bring our highly talented restoration team to your property and make your natural stone look new again. Prefer to DIY? Looking for products to clean and maintain your new or restored stone? Here's what you're looking for. As a family owned and operated business for over 40 years, we understand how important it is to provide trustworthy service and top-value results. Connect with us to learn more.